Hi everyone, I will be offering Easter photo sessions at three different Pet Valu locations. This is a great and inexpensive way to have a nice Easter themed photo of your pet and support local rescue groups too!! Oh yes, it’s that time of year again. And again, I am setting up in-store holiday photo shoots. I love working with PetValu to bring these fund raising sessions to their customers. We’ve had a lot of fun during the past shoots and these will be the best yet!! This year we are donating half the proceeds to Animal Rescue League of Berks County for the shoot at PetValu in Sinking Spring and PAWS for the shoot at the Ephrata store. So not only do you get a beautiful 8×10 print suitable for framing, but you are donating to animal rescues who so desperately need it. I hope to see you and your furry ( or not so furry if you have a Sphynx 😊) friends on December 1st or 2nd!! Walking through a park on a beautiful sunny day, one would expect to see dogs being walked, people walking or jogging, babies in strollers. But when someone brings a cat out for a walk, a lot of heads turn. Such was the case this past Sunday when Mason went for his first outdoor excursion. He did very well and made lots of new friends. Enjoy these shots from our day. Some of my favorite pup pics from this past year. Here are some of my shots of Bengals and Savannahs. When it comes to taking pictures of cats, patience is the only game in town. When they are your own cats, you have the leisure to get the shots when you want to. The cats are relaxed and don’t feel threatened. But when it comes to inviting someone into your home to get professional pictures taken, the cats may not be so relaxed. Such was the case with these Bengal siblings. It took some time, (and many treats) but I was able to get some great shots of these girls. 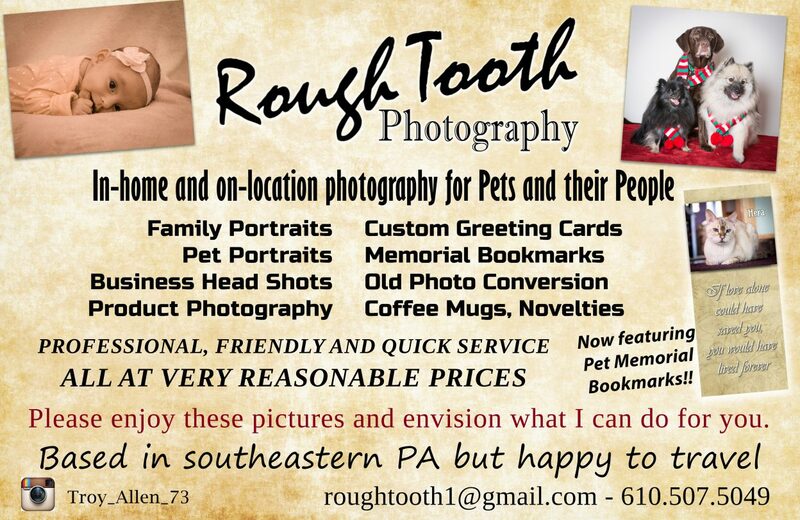 My first year in business as Roughtooth Photography has been quite an interesting one. Many opportunities have come my way and, always eager to expand my experience, I have tried them all. I have learned a great deal about the craft I have loved since my days of youth and I am looking forward to learning a lot more. From product, portrait and real estate photography to, of course my favorite, pet photography. Some say I am spreading myself too thin by not having a “specialty”. I say, my specialty is photography. Connecting with your subject and figuring out the best way portray it in an image is the kind of challenge I thrive on. Whether it’s a person, animal, motorcycle part, a 130 year old letter or a house, I can make it look great. Versatility is my specialty.